I was going to give you a brief primer on 'kebabs', the derivation of the word, differences between cultures, and so on. But after reading the Wiki entry on the kebab (or kabob, kebap, kebav, kebap, kebabie…. ), which was concise. informative, fascinating and rather long, I'll suggest, if you're interested, check it out yourself. 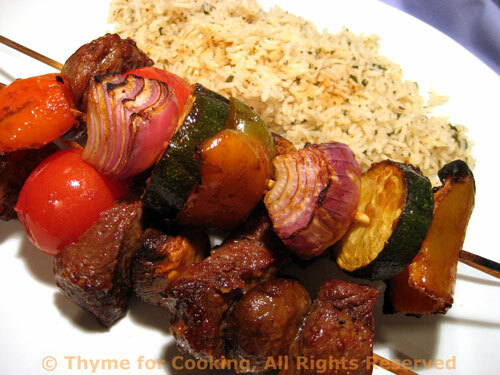 A 'kebab', as we think of it, is normally a 'shish kebab', or meat and vegetables cooked on a skewer. There is also a 'doner kebab' which is the tall spindles of roasted meat, slivered off and served, often in a pita, sometimes in a salad, sometimes in a pita with salad, and, mon mari's favorite, in a pita with fries (stuffed in the pita). Kebabs are, most traditionally, made with Lamb, and served with a yogurt sauce. Or pork or chicken or seafood or tofu or, as in these, turkey. I always cook the slower-cooking vegetables on separate skewers. I know a lot of recipes suggest pre-cooking the vegetables, but we prefer to do it all on the grill. We start the skewers with the onions, peppers and zucchini about 10 minutes before we do the skewers with the meat, mushrooms and tomatoes. 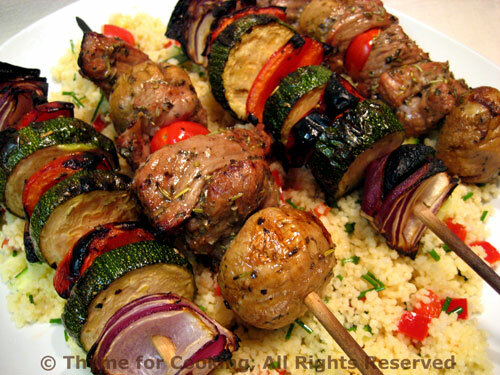 I marinated the turkey kebabs in teriyaki sauce and served them with Sesame Couscous and Peanut Sauce. Cut pepper in half, then each half into 4 squares. Cut onion into 6 or 8 wedges. Clean mushrooms. Slice zucchini into 1/2" (1.25cm) slices. Add pepper, mushrooms, onions and zucchini tio bowl and stir gently. 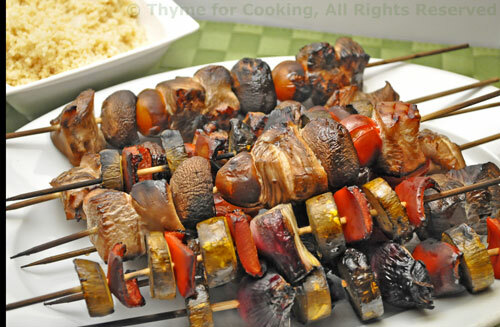 When ready to cook: Put turkey, mushrooms and tomatoes onto 4 skewers, alternating. Start to cook the vegetable-only skewers first, over indirect heat with the cover closed. After about 7 minutes, lift cover and turn vegetables, moving over direct heat. Add turkey skewers over direct heat. Cook for 6 – 10 minutes, or until turkey is done. Heat oils in small saucepan. Add chives and chili powder and sauté briefly. Add remaining ingredients and bring to a boil, stirring well to combine. Remove from heat and cover to keep warm. I do the same with kebabs – make separate spears for each veggie and kind of meat, so they all turn out just right. These look divine … even BEFORE I’ve had my breakfast! Another great thing we’ve skewered onto our kebabs is halloumi cheese. Alas, this is a cheese that we’ve been unable to source now that we’re living in France. You tried it? You FOUND it?! Best, Gee. Zoomie, I much prefer that to pre-cooking the veg. Gee, they’d be good FOR breakfast. No, sorry, never found halloumi…. 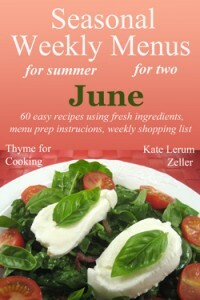 Kelly, we cook everything on the grill in summer!